Located near the intersection of N Beacon St and Market St, Extra Space Storage serves residents of Brighton, Allston, Aberdeen, Watertown, and more. Locals will recognize our facility near New Balance Factory Store and CVS. Extra Space Storage is located within five miles of Harvard University, Massachusetts Institute of Technology (MIT), Boston College, and Bentley University, providing accessible storage options for college students who need summer storage or storage while studying abroad. With a wide selection of storage units, heated storage, and exceptional security, Extra Space Storage on N Beacon St is the storage partner you can trust in Brighton! No matter what you plan to store, our Brighton storage facility can accommodate your needs! We have everything from small 4x4 storage lockers to large 20x23 first-floor units. Our N Beacon St storage facility is equipped with top-notch security measures like an on-site manager, 24-hour video surveillance, and electronic gate access to ensure your items are well-protected. When storing temperature-sensitive items in Brighton, heated storage is highly recommended. These units stay at a consistent temperature year-round, protecting your belongings from extreme cold. Heated units are available in sizes 4x4 to 20x23. At Extra Space Storage, we're dedicated to providing reliable self storage and excellent customer service. Our facility is always clean, secure, and well-maintained, and our friendly, professional staff goes the extra mile to ensure your needs are met. Contact us today to reserve a storage unit in Brighton! I trust Extra Space as I have used them in the past. The facilities are usually clean and well lit. They have staff on site who are approachable and friendly. The online and telephone support team are very efficient and helpful. There are many Extra Space Storage facilities in and around the greater Boston area. You acan always find a storage until with in your budget. Staff were incredibly helpful and flexible during a stressful moving process. Facilities are clean, orderly, and as described. No last minute surprises regarding the rental or move-in. 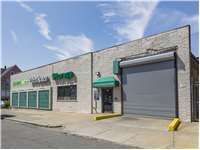 This facility is the best in the Boston Area for storage. Easy to get in and out. Everything is clean and secure. The huge "First month free" banner on the front of the building is incredibly misleading, since this only applies to certain units which are apparently almost never available. The service team is very friendly and helpful. They are pleasant guys to work with. Facility is clean and the there are plenty of ladders and dollies to help move stored items. This facility's indoor drop-off is important when it is raining or cold. I've been very happy with Extra Space on N. Beacon in Brighton. The guy that signed me up for the unit was completely knowledgable, friendly, and helpful and explained everything in detail; just overall great customer service. The facility itself is clean, well-lit, and well organized. Although I can't drive up directly to my storage unit, I do like that it's indoors and I can park my car and load/unload in any weather. I'd fully recommend this ESS location to anyone. I used it for 2 months. Staff is sometimes busy but always friendly. The space I rented is on the first floor, it's clean, with convenient access but also gives the required security. Facility is very secure with multiple "check points" to type in a code and also there are daily checks done by the associates to ensure the lockers have not been tampered with. The facility is also very clean compared to other storage places I have used and easy to maneuver large objects around. I moved to the Boston area a while ago, and I searched the internet a long time for an affordable, clean, and secure storage facility. The 235 North Beacon location offered a great deal online, and I am truly satisfied with its offerings, as it is easily accessible and, more importantly, clean and secure. No mice or bugs or any such thing. Even the restroom is spotless! Moreover, the gentlemen at the site are fantastic. The new manager and assistant manager are courteous and friendly, and they patiently and expertly answered my questions and addressed my concerns. I am truly glad for their help. Just a couple days ago, in fact, I needed to forward a number of large boxes directly to the facility, and both gentlemen handled the receipt of the items wonderfully, working with me every step of the way. The sincere manner in which they continue to take care of everything is impressive. Perhaps the previous manager was difficult to track down, but these guys are phenomenal. I am quite surprised to have found a self-storage facility in the Boston area at such a steal, and the fact that I am able to rest easy, knowing my belongings are secure, is a tremendous relief. Many thanks to the guys at 235 North Beacon! We have been with you for several years. We are thinking about renting a larger space. Sometimes it is difficult to find someone for questions, but we understand. Drive southeast on School St. Turn right onto Arsenal St. Turn left onto Louise St. Turn left onto N Beacon St. Pass IHOP then turn right to stay on N Beacon St. Pass Vineland St and our facility will be on the left. Drive northwest on Chestnut Hill Ave. Continue onto Market St. Pass Dunkin’ Donuts and turn left onto N Beacon St. Our facility will be on the right across from CVS. Drive west on Commonwealth Ave. Pass Target and continue straight. Continue onto Brighton Ave. Pass Cambridge St and continue onto N Beacon St. Our facility will be on the right across from CVS. Drive east on I-90. Take exit 17 and merge onto Washington St. Turn left to continue onto St James St. Turn right onto Charlesbank Rd. Keep right for Nonantum Rd. Continue onto N Beacon St. Pass Vineland St and our facility will be on the left.